All of us who love design and who spend time working on the decor of our homes want the same thing: to live in a beautiful space that looks like it could be featured in one of our favorite shelter mags. It's a good goal to have. It doesn't really matter if it ever does, just so long as it has the look that we really love. A lot of the time though, that's where things start to get really tricky. How do we create that on-trend editorial look in spaces that aren't in magazines but in the real world where stuff accumulates, kids are kids, wires are necessary and sometimes there's just no time and no energy to keep everything looking perfect? The truth is - it is a challenge. But the good news is that achieving the look you want is easier than you think. You can put yourself ahead of the game by having the fundamentals of your design in place. That will help you to achieve the look you want. After that, all you have to do is maintain it. 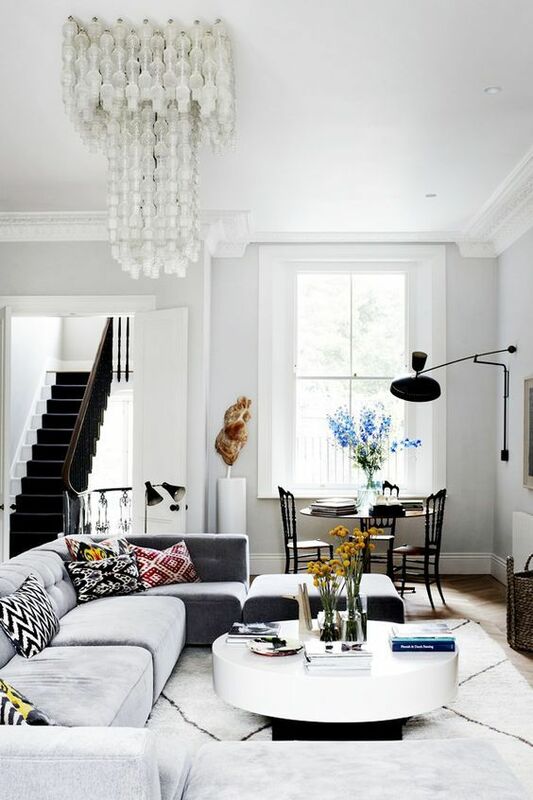 To help get that ball rolling here are 7 on-trend styling secrets that will help you design the space you've always dreamed of. This space is full of amazing design secrets, any one of which will help push your decor in the right direction. The color palette is a simple and classic black and white. Pops of color and global patterns come in through an assortment of pillows on the sofa. A Moroccan rug adds texture and a simple geometric print. But of all the things that this room does right, perhaps the most outstanding is the chandelier. A chandelier is jewelry for your interior. No room is complete without lighting and chandeliers are great go-tos. Colorblocking is all the rage right now. Creating an entire room in a single color isn't easy, but the results can be amazing. A great way to start is by matching your paint color to a favorite piece of furniture. The key to making a colorblocked space work is in finding room for patterns or complementary colors to create a stunning display. In this room, the green of the credenza and the walls match perfectly which makes the space instantly engaging. What keeps the color from becoming overwhelming however is the softer wood tone of the floor and the small pop of pattern from the rug. However, both of these elements are subtle enough to not compete with the green. As we've all learned from years of looking through photographic house tours, creating good vignettes is one of the central skills for a designer. And one of the most central parts of this skill is including fresh flowers as a finishing touch to the room. With something so small and simple as adding flowers it might be easy to underestimate its importance, but you shouldn't. Flowers are always wonderful to have in a space. They add a natural element to a space that is always refreshing. Visually, they add another layer of color that can act as a pop to brighten a room or match other colors in the space as a way of pulling everything together. Giving your space an artsy and sophisticated look is about skillfully doing the unexpected. Take people by surprise with patterns and colors in interesting places. This room gives us a perfect case-in-point. Painting the trim of your doorways creates a dynamic entrance while giving you a subtle and unexpected way to bring color home. Here's a secret for hanging your drapery that will improve the look of your rooms exponentially: always hang your curtains from the very top of your wall. It's important to do this even if the window itself doesn't go up that high. Hanging curtains from the highest possible point draws attention to the height of the space, a move that adds instant drama to your design. And if you want to be sure that everyone sees what you've done, make your curtains an important part of the room decor by hanging them in an eye-catching shade. Color is one of the most important elements in any space. Make your spaces stand out by thinking outside the box about color. This space gives just a hint of the possibilities when you play with complimentary color combos and make them your own. Instead of red and blue, try pink and peacock for a new and bright infusion of color in your interior. When you have high ceilings, take paint all the way up. Adding color to your ceiling draws the eye up, adding interest and height to your interior.